Ushio to Tora 2 ( Ushio and Tora second season ) is the second season and continuation of the Ushio to Tora anime that began airing Summer 2015 , it is an adaptation of the classic , award winning shounen manga by Kazuhiro Fujita which ran from 1990 to 1996 with 33 released volumes. Season 2 begins where episode 26 left off. The cast and studio have been left mostly unchanged with the adaptation being handled by the two studios , MAPPA and Studio Voln. And the same director and crew being left unchanged. Despite receiving the award for “ Best shounen “ in 1993 and the first season being very well received both the manga and first season flew under my radar and so all my notes come from a very uninformed viewing. However I believe this article still touches on the basic points and standards I hold every show up to. If you want to know how season two compares to the first or how well it handles the manga's original material then I’m sorry that you won’t find those answers here. “Ushio Aotsuki is a stubborn middle school student and son of an eccentric temple priest who goes about life without care for his father's claims regarding otherworldly monsters known as youkai. However, as he is tending to the temple while his father is away on work, his chores lead him to a shocking discovery: in the basement he finds a menacing youkai impaled by the fabled Beast Spear. Is how the MAL and wikipedia summarize the story but from what I can understand it runs as a more , “ monster of the week “ show with several different arcs. Even though I didn’t recognize the characters and world I still found the arc that season 2 starts on a really good story. The suspense and pace felt very early CN shounen , when anime was just making an appearance in the West after the initial airings of DBZ. Which brought me back and I realized how much I can still enjoy such fundamentally simple story-telling techniques. There’s a larger overarching story and a war between humans and spirits and the evil dragon Mono which gives the whole thing a sense of epic scale. The dialogue especially feels early shounen and from what I read people had a problem and called it cliche and unoriginal and this same complaints pops up regarding the show as a whole. But the way I see it , yes , the show can be corny and over-dramatic , but that’s what made people fall in love with old shounens in the first place. So I have no problem with Ushio doing what it does best even if it might seem outdated. OP is not quite heavy metal , but somewhere in that area. The visuals can only be described as , “ awesome “ , in the colloquial sense. Because who doesn’t get pumped up for , gnarly tiger spirits battling it out. The battle music and character and villains themes are a impressive and fit the tone of what they’re meant to back up. The more emotional tracks can come off as quite corny but I think that’s just part of the experience. The VA’s are both amazing, especially Koyama Rikiya who brings the gruff tiger demon Tora to live with his portrayal. The CGI is strangely used and generally rendered in a quite low quality with undetailed and one dimensional textures. The backgrounds are generally pretty rough and usually the camera makes sure we don’t focus on them two hard. The settings however are all rather inventive and feel like they’d fit in a world of spirits. The choreography and fights are very gritty and you can feel the speed and brutality of the attacks. 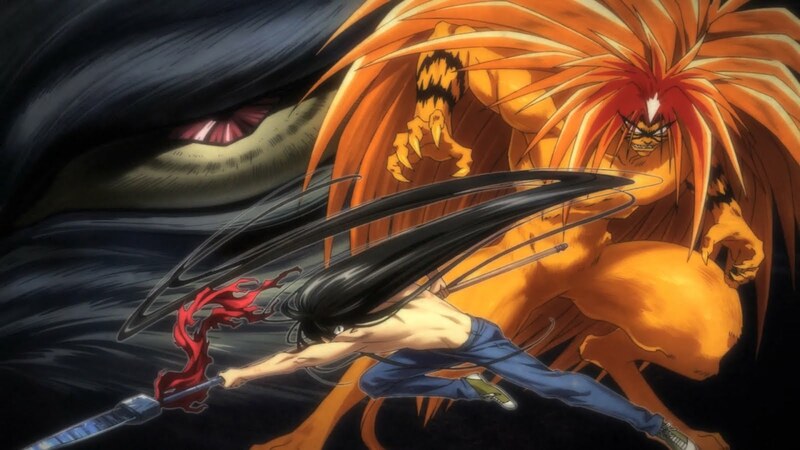 The combination of Ushio and Tora move in a perfect harmony that always looks amazing. It wouldn’t be hard to call the characters and their development , cliched. But the way I see it , it’s a case of “ Seinfeld isn't funny “ where in a good idea has be done so many times after the original product that people think that the original is a cliché whereas it’s actually far more inventive that the copies. The character designs are all extremely sharp , with strong outlines and a very specific essence that clearly separates them from the cheap 10’s imitations that come out every season trying to copy it with no success. The weapons all feel creative above just swords and bows but don’t go too far into the realms of impossibility. All the Yokai look amazing no matter how close or loose their ties to the original Japanese mythology and the designs range from cute to terrifying. It’s always cool to see something older get revamped and especially when it’s done in a way worthy of the original product. I’ll be sure to pick the manga volumes the first chance I have and I hope it’ll lead other viewers to discover this slightly older title.